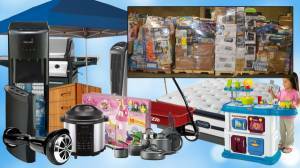 We Carry a Variety of Wholesale General Merchandise Liquidation Lots. Please review the listings below for further details. CTC is the nations largest Members Only Discount Store. Loads are predominantly made up of Customer Return items but will include a significant % of New Shelf-Pull and/or Overstock Items. Sold at a % of the stores selling price. This Listing is classified as General Merchandise but loads will contain a wide variety of items across multiple categories. Loads typically include: Men & Women's Apparel, Home Furnishing, Hardware, Appliances, Small Appliances, Domestics, Sundries, Food, Health & Beauty Aids, Automotive, Office Supplies, Housewares, Toys, Electronics & Much More. 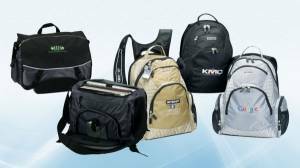 Featured Brands typically include: Samsung, Sunbeam, Ninja, Wahl, Canon, Braun, Duracell, Lasko, Hollander Sleep, Johnson & Johnson, Downey, Starbucks, Kraft Foods, Nestle, General Mills, Kelloggs, Chevron, Adidas, Calvin Klein, Carters, Levis, Tommy Bahama, Jockey, DKNY and more as well as Private Label Brands. Place your order online or call or email and we will get back to you with a competitive shipping quote. 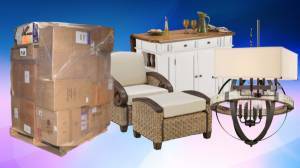 Customer Return Items in the Loads Typically Include: Furniture, Bedding & Bath, Housewares, Kitchen, Home Décor, Apparel, Accessories, consumer electronics, Sporting Goods, Tools & More. 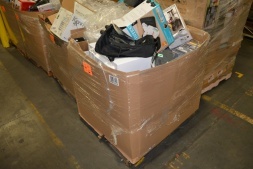 Shelf-Pull Items in the loads typically Include: Seasonal Goods, School Supplies, Cosmetics, HBA, Home Décor & more. 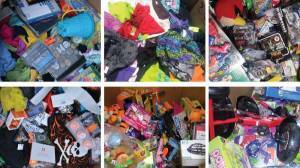 Assorted General Merchandise Online Customer Return Loads. Categories will vary from load to load. Sold at a % of Retail. 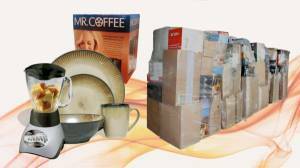 WM.com General Merchandise Loads. Categories will vary from load to load. Sold at a % of Retail. Categories for WM.com loads will vary from load to load including: Furniture, General Merchandise, Toys, Sporting Goods and more. Priced at a % of Retail Value. Please review available Loads to see details of current availability. Online Returns tend to be "cleaner" than Brick & Mortar Store Returns. Majority of items will be in original packaging. Loads are fully manifested including UPC’s and contain a wide variety of general merchandise such as: Hardware, Home Management, Cooking & Dining, Outdoor Living, Electronics, Toys, Bikes, Automotive, Seasonal, Pet Supplies, Bedding, Stationary, Bath & Shower, Luggage and more. Featured brands typically include: Nautilus, Schwinn, Ozark Trail, Coleman, Igloo, Firman, Hanover, Remington, Char-Broil, Huffy, Power Wheels, Kid Kraft, Radio Flyer, Intex, Little Tikes, Nerf, LG, Frigidaire, Haier, ClosetMaid, Better Homes & Gardens, Stanley, Pampers, Medela, Motorola, NUK, Emfamil, Huggies, Graco, Philips Avent, Munchkin, Crayola, Scotch, Paper Mate, 3M, Pyrex, BUNN, Gibson, Licensed Goods and more. 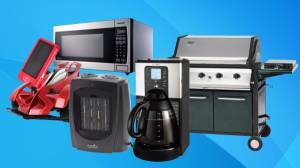 Items include but not limited to: Luggage, Comforter/Sheet Sets, Digital Skillets, Coffee Makers, Memory Foam Pillows, Mattress Toppers, Steam Mops, Pots & Pans Sets, Drinking Glass Sets, Dinnerware Sets, Juicers, Pressure Cookers, Cookware, As-Seen-On-TV items, Toys and much more! Brands include but not limited to: Sharp, Ruff Hewt, Rival, Mikasa, Mr. Coffee, Jack LaLanne's, Carpenter, Rapida, Corningware, Sango, Pfaltzgraff, TOBI, Oster and many more! Please see individual manifests for the particular product mix, values & price of each available load. Majority will still be in their original master case. Lots are made up from a combination of Open Cases, Showroom Samples & excess inventory. 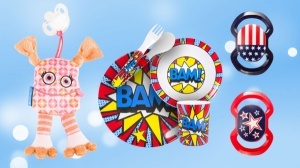 Many lots will include Branded & Licensed items. Typically Available from 1 pallet+. Typically, a 1.5x to 2x retail markup from wholesale value. Items typically included: School Supplies, Licensed Goods, small toys, Baby Items, Clothing Accessories, Kitchen, Hardware, Tools, Gift, Stationary & more. These loads are unmanifested, and contain a wide range of general merchandise products in a range of categories including: toys, kitchen and cookware, camping gear, indoor and outdoor furniture, exercise equipment, baby products, bedding, automotive, sporting goods, hardware, lighting, pet supplies, health & beauty, stationary, tools, outdoor goods, lawn & garden, camping items and more. 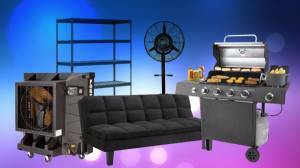 Items typically found may include but are not limited to: BBQ Grills, ride-on-toys, blenders, juicers, irons, coolers, toasters, deep fryers, humidifiers, aquariums, baby monitors, drills, heaters, fans, DIY furniture, canopies, scooters, remote control cars, tents, camping stoves, shelves, disc golf, chairs, futons, office organizers, bathroom storage, patio furniture, grills, elliptical trainers, roller blades, leaf blowers, bathroom fixtures, dishes, dinnerware and more. Featured brands typically include: V-tch, Fisher Price, Playskool, Little Tikes, Disney, Scott Shop, Meguiars INC, Travel Buddies, Rockland, Oversee, Sleep Innovations, Port-A-Cool, Acme Furniture, Coleman, Primo Bedding, Pangea Imports, Norstar and many other national and private label department store brands. Don't miss your chance to source these fashionable backpacks, laptop bags, and more. Majority of bags have an MP3 hookup, speaker, or both! Loads include various colors and styles as well as a small percentage of tool cases, tablet cases, & computer sleeves. Don't miss your chance to source these fashionable backpacks, laptop bags, and more. Majority of bags have an MP3 hookup, speaker, or both! Loads include various colors and styles as well as a small percentage of tool cases, tablet cases, & computer sleeves. Items in GOBA-LN-LOAD07 & GOBA-LN-LOAD08 are in master case condition and come in individual poly-bags, ready for resale! 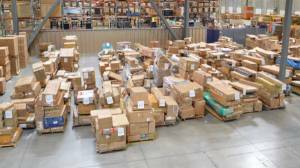 Majority of items in GOBA-LN-LOAD09 are in their master cartons, but some of the master cartons may not be complete. Each load has Retail Values over $100K. Average Retail Value per Unit is almost $52. Asking just 12.5% or approx $5.80/pc. Reasonable offers are considered. If you wish to Make an Offer, please do so using the Make An Offer button or submit your offer directly to your account manager. Perfect for Retailers, Online Sellers, and Export! Online customer returns from leading home remodeling and design website. Loads are made up of online customer returns. 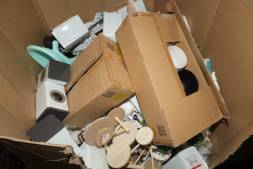 Large majority of goods are in shipping boxes or original packaging. Sold at a percentage of retail. 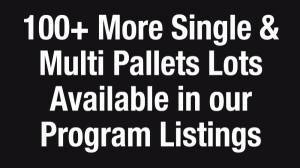 Loads are typically available in 1 to 24 pallet increments. Fully Manifested. 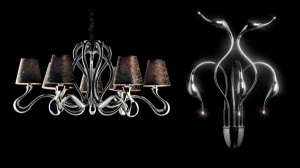 Loads include a variety of items like: chandeliers, armchairs, accent chairs, kitchen islands & carts, range hoods & vents, ceiling fans, bathtub faucets, dining chairs, barstools, counter stools, coffee tables, kitchen sinks, ceiling lighting, lamps, dining tables, comforters, comforter sets, wine racks, towel racks & stands, quilts, bedspreads, headboards, wall clocks, vanity lighting, bathroom sinks, towel racks, bed pillows, mirrors, fireplaces, office chairs, wall accents, outdoor pots, planters, curtains, bath mats, area rugs, dressers, and more home goods. Please view manifests to see complete details. All Loads are manifested, however at times manifests include items which cannot be scanned or fully identified and are lumped in under a general SKU. Online Returns tend to be "cleaner" then Brick & Mortar Store Returns. Majority of items will be in original packaging. Loads typically include: Home Goods, Automotive, Sporting Goods, Consumer Electronics, Pet Supplies, Grocery, Baby, Apparel, Tools and more. Featured brands typically include: Sony, Siemens, Sun Joe, Closet Maid, Samco, Hayward, MARS, Quaker, Cole Haan, Mazda, Toyota, Acdelco, NBA/NHL/NCAA licensed brands, FoodSaver, Sandvik, Bosch, Milwaukee, Under Armour, Oxi Clean and more. Loads are likely to include, but not limited to: Furniture, Home & Garden, Office Supplies, Electronics, Fashion Accessories, Baby, Bedding & Bath, Clothing, HBA, Holiday, Luggage, Sports & Toys, Pet Supplies, and more. 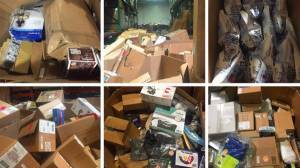 Liquidation of Manifested Online Customer Return General Merchandise Loads. Multiple Loads available. Please review manifests for details of the loads. Pictures are representative of the products. Starting at 12% of Retail. Reasonable offers are considered. If you wish to Make an Offer, please do so using the Make An Offer button or submit your offer directly to your account manager. Typically there are 24 pallets per load. However, they may be condensed to less upon shipment. Some loads may be floor loaded. At times loads are 30+ pallets. These loads will be loaded both palletized and handloaded. Great products for Retailers and Wholesalers! 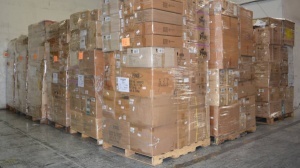 Loads are likely to include, but not limited to: dining tables, daybeds, bar stools, recliners, mattress toppers, beds, ottomans, duvet covers, comforter sets, tables, desks, lamps, housewares, kitchen products, housewares, pillows, outdoor items, storage units, dining chairs, desks, bookcases, domestics, apparel, and more. Pictures are representative of what you will receive and not actual pics. Please review manifests for details of the load. Typically there are 24 pallets per load. However, they may be condensed upon shipment. Great product for Retailers and Wholesalers! Clean General Merchandise Customer Return Loads. Most items in original packaging. Well Known brands. Unmanifested and sold at a flat price per pallet. These loads are unmanifested and contain a wide range of products across a variety of categories including: Toys, Housewares, Home Décor, Bed & Bath, Apparel, Footwear, Accessories, Cosmetics, Electronics, HBA, Personal Care, Holiday, Sporting Goods, Furniture, Baby, Patio & Garden, Luggage, Pet Supplies and more. Featured brands typically include: Barbie, Disney, Fisher-Price, Hot Wheels, Lego, Little Tikes, Melissa & Doug, Nerf, Nickelodeon, DC Comics, Star Wars, Bounty, Scott, Viva, Pampers, Honest Company, Huggies, Clorox, Lysol, Samsung, Sony, Bella, Black & Decker, Braun, Bunn, Char-Broil, Crock-Pot, DeLonghi, Electrolux, Faberware, Frigidaire, Hamilton Beach, Honeywell, Keurig, KitchenAid, T-Fal, Swiss Gear, Sharper Image, Hoover, Bissell and more much as well as Private Label brands. Please review sample images & videos to get a better understanding of what to expect. 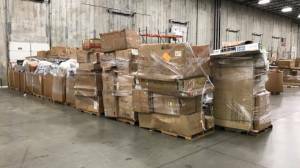 Liquidation of 2,000 assorted units of New Overstock natural pet calming product. The load includes 1,000 units of Pet Remedy Natural De-Stress & Calming 2 x Refill Bottles and 1,000 units of Natural De-Stress & Calming Sprays. 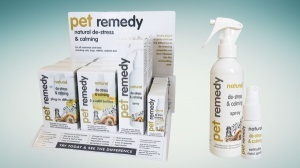 This is an opportunistic liquidation of 2,000 units of Pet Remedy Natural Pet Calming Products. The load includes: 1,000 units of Pet Remedy Natural De-Stress & Calming 2 x Refill Bottles and 1,000 units of Natural De-Stress & Calming Sprays. Expiry date for both products is 01/09/2018. The Refill Bottles have retail value/unit of $19.99. The Calming Sprays have a retail value/unit of $18.99. Total retail value of the load is just under $40,000. Your price is $2/unit, or $4,000 for the load. The special Pet Remedy blend of essential oils works as a natural relaxation and helps calm anxious or stressed pets. Pet Remedy is not a veterinary medicine. It works alongside the brain’s natural “messengers” called neurotransmitters, which work by telling the nerve receiving the message either to calm or get “fired up”. In times of stress or anxiety the nerves get over stimulated, which leads on to the many different signs of stress we see in our pets. This is an opportunistic liquidation of 17,280 units of Relief4Life Super Yoga/Fitness Stretch Straps in their original master cartons. Load has a total retail value of over $170,000. Your price is just $0.50/unit, or $8,640 for the load. Goods are packed in their original master cartons. There are 24 straps per carton, 40 cartons per pallet, and 18 pallets total. 16 different sized loopholes so that it can be accommodated for any height and any stretch. Color indicators to measure the progress in flexibility and mobility. It also has an easily defined midsection so that you can tell the stretching straps are symmetrical. The Yoga/Fitness Stretch Out Strap from Relief4Life combines simple stretching science with simple moves that give you relief specific for back pain. You will use your Relief4Life Super Strap to help support and guide your body precisely as you perform science-based moves. Feel your body unlock almost like you are picking a lock with a secret scientific combination. See for yourself how these gentle moves can help wake up back, shoulders, hips and legs and can also be used for yoga, pilates, fitness. Decompress your body and stimulate oxygen, circulation and nutrients so you feel great again. Liquidation of New Overstock Ultra Violet Mini Fluorescent & Spotlights and Ultra Violet Markers. This is an opportunistic liquidation of approx. 21,600 units of New Overstock Ultra Violet Mini Fluorescent & Spotlights and approx. 36,576 units of Ultra Violet Pens. Price is $0.12/unit, or $7,211.52 for the load. 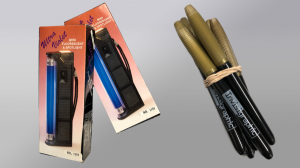 The ultra violet mini fluorescent & spotlight is a hand held portable UV black light that helps you find those ‘invisible’ sources of odors without sniffing your carpet. It can also be used as an illumination apparatus, a money detector, detect invisible inks, hand-stamp screening, and more. The pen can be used to imprint possessions with a code or specific number, such as a social security number or driver’s license number. The “ink” used in the pen does not leave a mark unless the item is viewed under an ultraviolet light. The pen is non-toxic and can be used to mark electronic equipment, furniture, jewelry, crystal, paintings, antiques, fire arms, tools and much more. When items are market, the police can identify who the items belong to and return them. Please review the downloadable pdf for details and specs on the products. Opportunistic Liquidation of New Overstock Fetal Heart Monitors, Bike Pumps, Digital Tire Inflators and Vacuum Sealers! This liquidation includes approx. 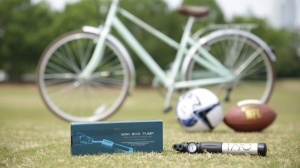 8,483 units of New Overstock Fetal Heart Monitors, Bike Pumps, Digital Tire Inflators & Vacuum Sealers. The goods Wholesale Value per unit ranges from $3.45 - $40.72. The Total Wholesale Value of the load is $100,013.75. Your price is 15% of Wholesale, or $15,002.06 for the load. Please see tables below for the available UPC and ASIN info. Great products for Retailer, Wholesalers, Online Sellers, and Export! Brand new master case BooginHead baby accessories including: Plush Pacipals, Five (5) Piece Dining Sets, 2 Pack Patriotic Pacifiers, & 2 Pack Crinkle Sensory Pacigrips. Please refer to manifest for complete details, and chart below for UPC and Master Case info. Total Retail Value of the load is over $110,000. Your price is $7,428.90, or approx. $0.49/unit. BooginHead makes infant and toddler feeding and soothing accessories that will fit easily into your lifestyle and improve your experience of parenthood by saving you money, time, and energy. Now more than ten years in business, BooginHead products are well-loved by parents everywhere for their unmatched high-quality construction, stylish patterns, versatility, and attractive price. Excellent for discount stores, schools, children's activity centers, online sales and more! Opportunistic Liquidation of 6,000 Lock Guards. 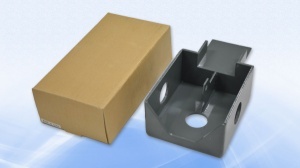 This liquidation includes 6,000 Lock Guards in their master cartons. The Lock Guard is a unit that covers padlocks and hasps of cargo trailers, storage containers, and shipping containers. Each unit is individually boxed and there are 10 units per master carton. Each unit retails for $55. Total retail value of the load is $330,000. Your price is $1.50/unit, or $9,000 for the load. Opportunistic Liquidation of New Overstock Home Décor, Backpacks, Home/Office Organization, Bath Products, Gifts, & more! This liquidation includes approx. 9,380 units of assorted Home Décor, Backpacks, Kitchen, Office, Accessories, Jewelry Organizers, Bath Products, Pet Products, Gifts, and more. All goods are New Overstock. Sold at 25% of Wholesale. The load is fully manifested and includes items such as: biking backpacks, school backpacks, office organizers, dish rack sets, makeup organizers, drying racks, chalkboards, handbags, spice racks, wine racks, decorative storage bins, jewelry displays, and much more. Please review manifest and downloadable pdf below for details. Please note that these goods cannot be sold online, including Amazon worldwide and eBay. The goods average wholesale value is $7.62/unit. The load has a total wholesale value of almost $70K. Your price is $17,857.51, or $1.90/unit. This load will require two 53’ trucks or two 40’/45’ ocean containers. Great product for Retailers, Discount Stores, Wholesalers, and Export!